Jackson’s Liberty Magnet School earned the Governor’s Environmental Stewardship Award for its Farm to Tray program. Students at Jackson’s Liberty Technology Magnet High School are seeing first hand how agriculture can positively impact local schools – and an entire community. Through the school’s Farm to Tray program, students grow fresh produce for Liberty Tech and seven additional school cafeterias in the Jackson-Madison County School System (JMCSS). “Our students enjoy being able to eat what they produce,” says Teresa Crouse, Liberty Tech agriculture teacher and FFA advisor. Established in 2009 as a partnership between the Liberty Agriculture Program and the JMCSS School Nutrition Department, the Farm to Tray program “was started to prepare students for food production in a changing world,” Crouse says. Students help grow lettuce, tomatoes and cucumbers, both during classes and outside of school hours. The fresh produce is served at Liberty Tech and sold to the JMCSS School Nutrition Department, which distributes the foods to school cafeterias within the district. The produce is also delivered to the Taste of Liberty, a cafe managed by the Liberty Tech Culinary Arts Department. “Students participate in planting the seeds, analyzing the vegetables as they grow under specific conditions, and are heavily involved in harvesting, packaging, serving, marketing and conducting nutrition education,” Crouse says. The latest production numbers totaled 4,782 heads of Rex Bibb lettuce, 843 pounds of European cucumber and 935 pounds of tomatoes. These vegetables were produced in Liberty Tech’s three greenhouses, each of which comprise nearly 3,000 square feet. However, the school will soon have the ability to produce even more fresh produce, thanks to donations from Delta Faucet. After committing $5,000 to help Liberty Tech build a new greenhouse, Delta Faucet – a Partner in Education with the school – donated 4.4 acres of land to the Liberty Agriculture Program in 2014, and a four-phase plan is in the works. Named Liberty Acres by Liberty Tech students and located across the street from the school, the property’s first phase is expected to yield its first crops of broccoli, cauliflower, cabbage and lettuce in the spring of 2015. In addition to planting the crops, students also surveyed the land in phase one and determined the best location for six raised bed gardens. 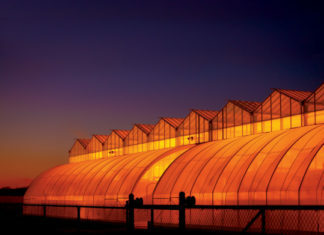 Phase two involves building high-tunnel greenhouses, a shed to store supplies and compost, and permanent outdoor signs. During phase three, an irrigation system designed to use collected rainwater will be added to the property, as well as a tilapia farm. Phase four’s development will include the construction of a solar farm that will provide electricity for outdoor LED lights, security cameras and power tools. “It [Liberty Acres] furthers Delta Faucet’s mission as a community leader, and the organic growing methods used on the land further the company’s green initiatives,” Crouse says. Additional crops planned include tomatoes, beans, corn, squash and cucumbers, and all of the produce will be organic. Due to the expansion, Liberty Tech expects to eventually supply all 28 JMCSS cafeterias with fresh produce. 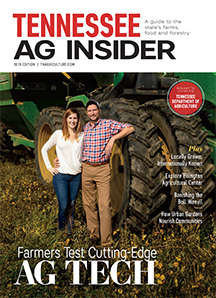 The Farm to Tray program is receiving attention across the state and country for its innovative practices and continued success. In 2012, the school district won the State of Tennessee Overall Award for Excellence in an Education Program, and in 2013, the program won the USDA’s Best Practice Award. In 2014, the program was awarded a Tennessee Governor’s Environmental Stewardship Award. In addition, school leaders from across the nation visit Liberty Tech annually, demonstrating the program’s role as a model for agricultural education in the U.S.
“These programs [Farm to Tray and Liberty Acres] represent the very best in that they support a unique, community-based partnership linking real-world business with student learning,” says June Murry, Liberty Tech principal. Celebrating years of education, research and agritourism in Shelby County.